I will discuss this only shortly, as this part of the accident in the Alma tunnel in Paris, has been discussed in-depth by many. 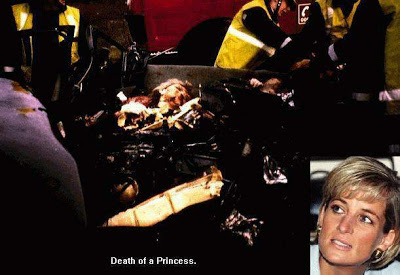 Why did it take this long to bring ‘lady Diana’ into a hospital, so she could have proper medical care? Google it. The ambulance arrived on the scene 15-16 minutes after the crash. This is still in the range of a normal response time. From that moment on, everything takes longer than expected. Was it necessary to take off the roof of the Mercedes to get her out the car? Why did it take so long for the ambulance to actually leave the scene of the accident? As far as I can tell, it took one hour for the ambulance to actually start moving? There are several quality hospitals within 4 km from the crash site, why was the Hospital Pitié-Salpêtrière chosen? Why not the Hospital Val de Grace? Why did it take 43 minutes to drive from the Alma tunnel to the Hospital Pitie-Salpetriere, which is only a 5 km ride? Why did the ambulance stop for ten minutes (!) outside the French Natural History Museum, just a few hundred yards from Le Pitie Salpetriere Hospital? When the whole world is watching, it is unbelievable this happened. With someone like Fred de Brouwer, they can get away with it. With lady Diana? It is expected that discussions afterwards will be about the paparazzi and the medical care. The scandal -again- is handed to us. To say it bluntly, if you do want to kill someone by ambulance, there are more subtle ways to do it. They could have done it with less questions asked. So that is not what happened. This entry was posted in Maatschappij and tagged Alma, ambulance, bridge, Diana, Dodi Al-Fayed, France, hospital, Paris, rescue, Salpetriere, tunnel, water. Bookmark the permalink.